Today I am so happy to introduce you to my friend Kay, she is our sister in Christ and a great cook. Kay is a "professional caterer turned Church Cook finding a great joy feeding His sheep, literally!" You can follow her at her place, The Church Cook, where she shares great recipes, cooking tips, her favorite kitchen gadgets and much more. It is such an honor to be able to do this for Becky. This is my very first guest post; we'll see how it goes! Thank you Becky for giving me this opportunity. After 15 years of large-volume cooking, I have done things instinctively. So, I had to stop and consciously think about each step that had to be written down. This is a long post but I hope it will be helpful to you all! Whether I am planning my children's birthday party for 20, my church's ladies tea for 100, or a wedding reception for 450, the planning and food preparation method is the same. This is where it begins. Here are some guidelines for planning a good menu. *Choose a menu which are appropriate for your guests. It's not about what you want to cook to impress, but what your guests would enjoy. *Choose one or two food items which can be frozen ahead: breads, cakes, many baked goods can be frozen before baked. *Want to try a new recipe? Try one new recipe at a time. This way if the new recipe flops, you have your tried and true dishes to back you up. 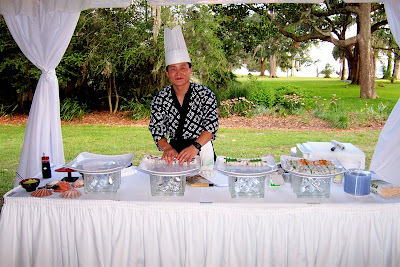 *Don't have too many last minute to-do food items, like sushi for 150, unless you can hire someone to do it for you at the party. *In the folder, have all the contact numbers you will need for the party: bakery, florist, rental company, etc. This is the hardest part for many novice event planners. Making too much food is the most common mistake. Here are some hints to avoid excess food . *Recipe for a side dish which serves 6 will serve twice as much when serving in a buffet with other foods. *After the recipe conversion, write out the grocery list. Go over each recipe and list every ingredient you will need. Check your pantry before you go to the store. *For Sam's Club business members, Sam's Club has Fax 'n' Pull or Click 'n' Pull service is where you send in your grocery list and the store will gather the items and have it ready! It's a great time saver. Check if your local grocery or warehouse store offers similar services. *Most of your groceries (non-perishables) can be purchased a week or more ahead. Don't wait until last minute to shop. This is a must to keep your sanity in the kitchen while you are prepping. A prep list also guides your helpers/staff. *Before I enter the kitchen, I write down and organize the prep list. If you have a large event, make foods a week or two ahead and freeze. Many sauces or dressings can be made several days ahead. Do it ahead! I usually do the bulk of my prep work two days prior to the event. Ideally, the day of the event should only be last minute assembly, cooking, and garnishing! I try to avoid prepping on the day of event. Click Here for more Cooking Tips from my blog. Baked Goods: breads, rolls, and pie crusts and be made and frozen unbaked. Bake on the day of event for freshest taste. If you can't freeze baked goods ahead, measure out dry and wet ingredients beforehand. So on the day of, you will assemble and bake without having to convert recipes and measure ingredients. Limes and lemons can be juiced up to five days ahead. Most veggies and fruit can be prepped two days prior. Delicate greens like herbs can be trimmed and washed early but chopped last minute. Everything made ahead should be stored in containers or storage bags and labeled. *Prep veggies and fruit before prepping meats. Be aware of cross contamination. Wash your cutting boards, utensils, and equipment well during prep. *Don't try to prep by yourself. Have a person or two to help in the kitchen. 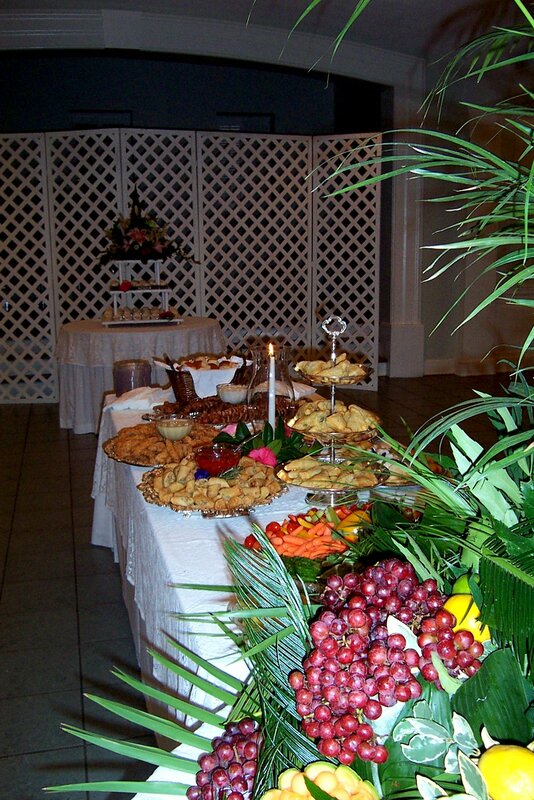 or decorate the buffet table.....just make it less stressful for yourself and prep as much as you can! This is the fun part! Most of the hard work is done and now it is the day where you put it all together. This is where you do final baking, heating up, or assembling of the foods already prepared. Candles are lit, and tables readied. And your friends will say, "This is beautiful! You make it look so easy!" Of course they are seeing the result of your labor of love: numerous hours of planning, shopping, and preparing. Make a note for yourself. *Too much, too little food? *What can be done next time to improve? *How much did this menu cost? Tally up your receipts. This is a lot of information to digest, isn't it? I wish I had this knowledge back 15 years ago! But I am so grateful to share it with you. I pray this little bit of knowledge will bless your family, friends, and your church. Peek into My Daily Journey -through my lens- ; today St Andrews Castle, the castle where John Knox preached in Scotland. This entry is linked to Raising Homemakers.